CSA Buried Treasures-Inspired by true stories. 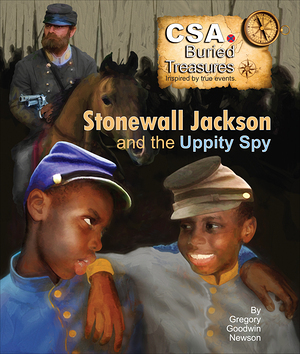 Stonewall Jackson and the Uppity Spy book tells the semi-fictionalized story of two young twin black brothers whose life paths diverge in very different directions during the American Civil War era. The young black boy, Jim Lewis (who is based on a historical real character), is chosen to be a house slave to Thomas J. Jackson (soon to become General “Stonewall” Jackson). Jim’s manners, intelligence, and Christ-like character impress Jackson and endear the boy to him. When the war comes, a mature Jim serves as General Jackson’s trusted body servant. The two men grow close, and Jackson respects Jim’s loyalty and wisdom so much that he sometimes lets Jim serve as an adviser. Jim’s twin brother Tyler, on the other hand, is the fictional protagonists that was a leased out field hand from General Jackson’s plantation, and he suffers mistreatment at the hands of a harsh overseer. The life of a field slave and house slave are contrasted in the experiences of these boys.